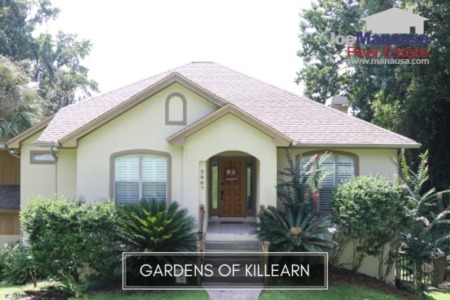 The Gardens of Killearn is a small neighborhood within Killearn Estates that features 3 and 4 bedroom single family homes that were built mostly in the 1990s. And just as you will find for its parent subdivision Killearn Estates, homebuyers are drawn here for "location, location, location." The following list of homes are the active (available) listings in the Gardens of Killearn. It is important to note that the narrative contained below is for sales through December for all previous years, but only through the 17th of April in 2017. The graphs and the closed sales table will be continuously updated into the future (meaning bookmark this page if you always want to know the current status of homes in the Gardens of Killearn). The average existing home price is $290K for the Gardens of Killearn thus far in 2017. This is up another 3% over last year's average (which was up 3% total for the year). This high demand neighborhood is getting more expensive. Home sales activity has been robust over the past two years. Currently, there are six homes for sale in the Gardens of Killearn, and three are already under contract. There have been only two closed home sales in the Gardens of Killearn through the writing of this report. The average value of a home sold in the Gardens of Killearn in 2017 has been $130 per square foot. Increased demand (coupled with lower inventory) will continue to push these home values higher for the foreseeable future. 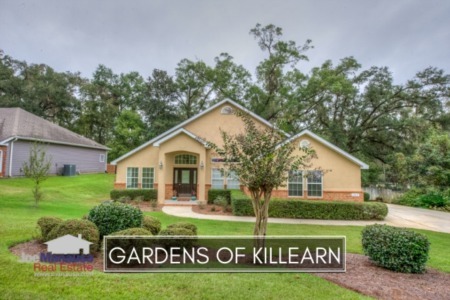 Properly marketed homes in the Gardens of Killearn will sell right away. The average home size sold in the Gardens of Killearn typically falls in a range of 2,100 to 2,400 square feet, and this year is no different. The average home size sold in the Gardens of Killearn this year has been 2,237 square feet. I hope you enjoyed our April 2017 update on home sales in the Gardens of Killearn, please feel free to drop me a note if you have questions not covered in this report.